Sacrifice Shambling Shell: Put a +1/+1 counter on target creature. More dredge! The deck is less tiny tokens and more beefy tokens. For example, there's no Craterhoof in here. The last update on this deck was 4 months ago, have you considered adding some newer cards? I find that Krav, the Unredeemed has put in a TON of work for me. The growth, the card draw, and the lifegain can quickly get out of hand and it's pretty hard to beat a single : sac as much as you want ability! Razaketh, the Foulblooded and Journey to Eternity Flip haven't done as much heavy lifting for me yet, but have huge potential as Razaketh is a nearly free sac outlet and instant speed tutor once out, and Journey is just another great way to recur creatures. Another thought if you wanted to go with +1/+1 counters (which I realize that this particular deck doesn't focus on) would be to include Shambling Shell as it dredges 3 and gives out a +1/+1 counter as well. I also had some questions for you... Do you really find Awakening Zone and From Beyond to be worthwhile inclusions? I already own a copy of From Beyond, but it seems kind of slow on the token generation and never seemed that useful in my early builds, so I pulled it out. I also see that you're running 37 lands, while my deck runs 34 and I almost never hurt for lands with all the ramp and land tutoring. Just starting out with a Sakura Tribe Elder in your hand and basic Forest and Swamp is often enough to get a ton of mana on the board from my experience, do you have issues getting mana flooded?. One last question, I promise! Have you thought about Reassembling Skeleton? It's done a lot of work for me as an early sac target to get XP counters, and once you get Skullclamp out, together they basically read: ", : Draw two cards", but you know, with the added bonus of all the death triggers. Thanks for a great deck tech, you've given me some ideas to tweak my own deck! I hope that we see you do a tech on other Meren builds like tokens and +1/+1 counters! Shambling Shell, Life from the Loam, and Dakmor Salvage. Green/Black also has lots of spells that self mill or tutor and put something in the graveyard. Jarad's Orders is just one example. Hey, consider speeding up self-mill by adding more two drops? A plan should be to be able to consistently self-mill a dredge card turn two/three this sets up the game very well for you. There's a lot of powerful green two drop spells that self-mill, in my opinion even though these spells are not creatures they're too important to set-up dredge in the early game while also potentially getting you a card. These cards also help in the early game to set-up Loam by putting it or lands into your graveyard. Since you're not playing any Fetch lands you want other ways to get lands into your graveyard in the early game. The nice thing about Salvage/Commune/Grapple is they can potentially get you a land. 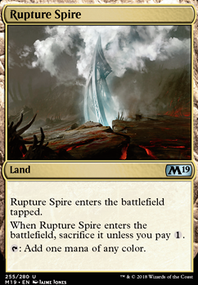 When you're self-mill/dredging while also trying to get to six lands to play Izoni this is helpful to make your land drops. Hermit is less good when playing lots of Basic lands, but it is still one of the fastest ways to self-mill the most cards in green. His ability is repeatable each turn, that's great for self-mill and it's good that he can also find a land. Fauna is great with dredge creatures because they can be constant fuel to discard because they can keep coming back to your hand after dredging to then be discarded to tutor for another creature. 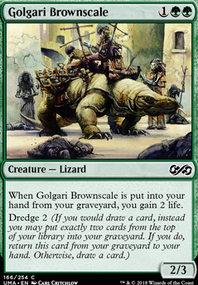 Getting dredge creatures into your graveyard while also tutoring for another creature is pretty busted. Existence is nice to be able to discard a creature card and then recur a creature, good with value creatures who have ETB/die abilities such as Wayfinder, Sage, Tribe Elder, Visionary, Plaguecrafter, etc. 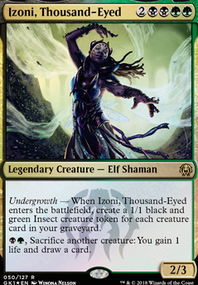 If you self-mill/dredge Dread then you can potentially reanimate something for free the turn you play Izoni by sacing Izoni and two other Insects or just three Insects. Dread is powerful with Insects. 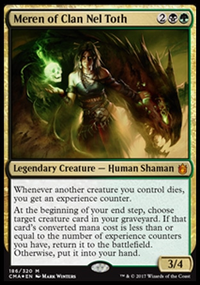 Intent is one of the best budget tutors in Commander especially when sacing a creature is very beneficial. Sidisi is a creature who's also a tutor and self-sac. 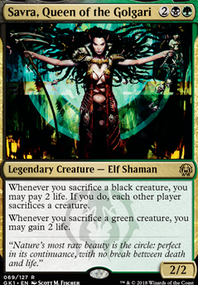 Sage is pretty much a green staple for Commander. Plaguecrafter is an updated Fleshbag/Executioner, an effect that makes all opponents sac a creature/Planeswalker can be very helpful in some situations. 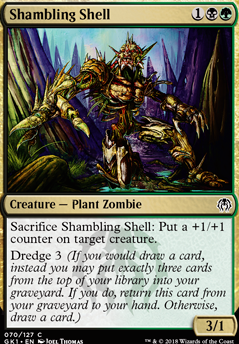 Shambling is another dredge creature, even though it's the least good of these creatures, it's more dredge. I realize I have suggested a lot of cards to add; if you would like help with what cards to cut I offer more advice. So, I think the main issue that I and other commenters seem to be getting at, but not saying is that deck as is seems fairly inefficient. I’ve read why you don’t want Wild Mongrel or Putrid Imp in the deck and that’s fine reasoning, but at the same time Midrange thrives on being mana efficient and right now the deck is relying on 3-4 Mana beaters which relies on you casting multiple 2 mana spells to be active consistently. This simply isn’t where we want to be as far as Midrange in Pauper is concerned, as the format has both cheaper threats and cheaper removal that makes this deck susceptable to losing mana and card advantage. Because I assume we want to keep the Delirium sub-theme, I’m not going to say “Play G/B Morbid or G/B Tortured Existance instead” but I will say that this deck could probably cut some inefficient cards like the Rhizome Lurcher and Shambling Shell as well as Drown in Filth and Grapple with the Past to instead round out the 3 ofs in your deck to playsets as that will increase consistency. That will leave some blank slots however, too which I would add Thorn of the Black Rose and Grisly Salvage as card advantage engines as well as Executioner's Capsule as an efficient kill spell that turns on Delirium easier. Hope this helps! Thraben Foulbloods is a bit weird. 3 mana for a beater is kinda a lot, but a 4/3 Menace is actually a serious clock that a lot of decks have trouble with. It's also not even that bad if our opponent nukes our graveyard since a 3/2 is still an ok threat. I'm also hesitant to cut it since we'd be left with just two Delirium creatures. That said, I'm not opposed to cutting it, I just don't see anything better in its slot. I'll go to bat for Shambling Shell, though. That card consistently impresses me. 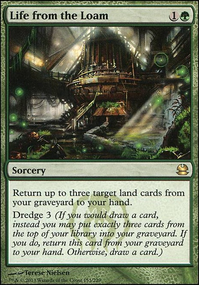 Dredge 3 is a sweet spot where we can Dredge every turn and fill our graveyard efficiently without having to worry S about decking ourselves, it can put itself into the graveyard for value, and 3/1 is a very aggressively statline when we don't care about trading it away. I started out testing it as just a 1-of and I'm seriously consider adding in the 4th copy. It's overperformed like crazy. Overall I worry that you play too many expensive cards whose value isn't guaranteed enough when they hit play, like Thraben Foulbloods and Shambling Shell. I know you want a good card for the 3 spot on your curve, but I feel both of these are pretty weak. I say that, but I don't have any ideas about what to put in their place. That said, you might want to consider cards like Scythe Tiger who is strong, fast, shrouded, and lets you choose to put one of your artifact lands in play to speed up delirium. I'm also a fan of Harvest Wurm, who unfortunately probably won't work for your purposes since it specifies basic land. Cadaver Imp could be really good depending on how it interacts with your deck, and Unearth goes well with it. If you want a sideboard replacement for your finishers that is less vulnerable to control, Blastoderm is always a good threat. Most of my suggestions either stray away from your core deck theme or maybe won't help with it's current form, but I think they're good to keep in mind.